Another is that my personality is very much the artistic, creative, kind. I love making things and keeping my hands busy. From crocheting cute hats with flowers to making a new necklace and splashing paint to making a new wall hanging, I’m all about creating. And while I also love to read and can devour books in mere hours, I have to be in that mindset. And these things kind of crash together when it comes to having good, solid quiet time with my Father. I often have to force myself to take the time for it. And I think these aspects of me are why I was so curious about Journaling Bibles. I’d seen a picture here or there (or, let’s be honest, all over social media…) of people doodling reminders and phrases in the pages of their Bibles. Oh, I’ve done this my entire life, but it was always in the teeny-tiny spaces between columns and verses. These people had INCHES. And I was jealous. 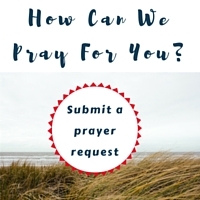 Enter…Christmas and a request for a journaling Bible. WITH. LOTS. OF. SPACE. FOR. PEOPLE. LIKE. ME. TO. WRITE. ALL. OVER. EVERYTHING. I know we always have room to grow and I am far from perfect, but I will say that having my own journaling Bible has made a huge difference in my daily life. I actually look forward to opening it, to reading, to learning, and yes…to drawing out a reminder (or five!) each day. And sometimes…well, sometimes those dreams involve doodling out the reminders that need to be planted in our hearts, too. I know having the chance to dig deep into the Word and to be myself by doodling all over the margins has made such a difference. And I want to bless one of you with a journaling Bible. I’ll choose a winner on Wednesday night and get the Bible sent out to the lucky winner! Do you sometimes find it challenging to carve out quiet time? What are some things that help you dig deeper? This post is so me. 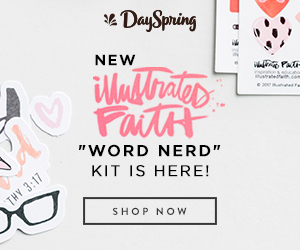 I have joined Illustrated Faith and Documented Faith to help me in my journey. Oh, how I wish I had a journaling Bible to go with my journal. I am still making itty-bitty notes in my tiny margins. But, it is still keeping me focused and helping me spend time with my God! I love that you are still making those notes, even in the little margins. I have to remember, in the middle of my doodling, that the time with God is what’s really important. 🙂 Thanks so much for stopping by today, Kelli! Blessings. It is good to find that thing that speaks your soul language. I love Nancy Leigh DeMoss’ wisdom, “It is easier to breath life into a dead routine than to try to breath life when there is no routine at all.” Doodle away! Oh, that’s such a good reminder! It feels good to have an “alive” routine again. 🙂 Blessings, friend…thanks for being here! Mel, I love this post for several reasons & trust me, I will be sharing this post 🙂 While I am not a “doodler” in the sense of artistic, my Bible margins are written in all over the place. And when I run out of space, well index cards take over. It is the writing, oops doodling, which makes the Word so personal to me. I have seen these doodling Bibles & admired them as I see the photos of the beauty others create in them. Thank you for this post & for the giveaway. I love this post, Mel! For the past few months, I’ve been using colored pencils to circle, highlight, underline, and draw a bit on my Bible. I used to not mark in my Bible at all. I wanted it to be fresh each time I read it. But my current Bible is a $17 version, so I figure when I’m finished doodling up this one I can just get another one. The impact it’s having on my spiritual life is worth it. It has definitely helped me gain insight and think more creatively about God’s word. Happy journaling! I say doodle away! (In fact, someone told me that in a previous comment.) 😉 I love how He created each of us to learn and grow in different ways…and I think it’s awesome that we have a beautiful (and colorful!) way to record the things that mean so much from His Word. Thanks for being here today, friend! Thank you for your sweet encouragement today, friend. 🙂 I actually found mine on Amazon, and I love it…but it must have been popular because it’s been sold out for months. You’ll have to let me know which one you decide on! Thanks for sharing!! I recently started writing notes and doodling in my Bible to make sure I remembered what I was reading instead of just flying through it. What a huge difference!! Loved this post! I’ve been trying to doodle in my bible but never have the space to do so. And doodles are so good for the brain to learn and absorb. Thank you for sharing! I have been using the book Praying in Color. As for opening my Bible….I am just burnt out due to being at a major Christian university for my Master’s. I’ve heard about that book here and there…I just looked it up and decided it needs to be on my wishlist. 🙂 Sending you a hug and praying God’s blessings on you today, friend. Thanks for stopping by! I love this post! Definitely something that I need as I have a hard time keeping a notebook with my Bible all the time. Great idea! Hi, friend…I love seeing you here today. 🙂 You’d definitely love having one…it’s made such a difference. I love this concept of a journaling Bible. I’ve seen many of these ideas on Pinterest and other sites and it’s always interested me as a creative way to read and take in the Bible. You are not alone in your struggle and I appreciate your honesty on the struggle to really get into the Word! This Bible with journeling space seems too good to be true. I hesitate to write in my Bible as there is hardly room and so I just underline. Thank you for the opportunity to experience a great way to personalize my Bible and enjoy deepening my love for reading God’s Word. Mel, thank you for permission to write in your Bible. I didn’t need it, but likely a lot of women do. So many consider the Bible such a holy book (which it is, of course), but it’s not the physical book that is, but the contents. And when we interact with God on the pages of our journal, it’s one way in which He makes us holy–set apart. Sometimes the net of words in my Bible become so thick, that I just have to begin again with a new Bible. And ones with wide margins are not always easy to find. So the one that you are suggesting sounds wonderful. And admittedly, I have never drawn in my Bibles. I do in my journals, and I like to collage their covers (inside or out). I’m finding the older I get, the more color I desire. It adds such vibrancy to life. And “images” (not vain ones) help us to picture and remember what God is showing us. So sign me up! Thanks for an insightful and encouraging blog. I really appreciated it. I have used a journaling Bible before. I am creating one for each of my children…doodling, marking verses and journaling thoughts for each of them when I am gone. Would love to have another one to be able to complete my task! It’s a wonderful way to pray/commit our children and they will have the memory of my thoughts and God’s reminders for them when I am gone! That is so beautiful and such an incredible legacy to leave for your children…what a great idea! I’m the mama of a sweet little girl, and I hope someday my Bible will mean a lot to her, too. 🙂 Blessings! Id love for an opportunity to become a bible doodler. It’d be a wonderful way for me to spice up my bible reading life! I have been wanting one of these!! Love that verse, too. 🙂 Thanks for sharing today! I’ve been wanting a doodling Bible for so long! I’ve always studied and learned better when I’m engraving The Word into my heart through writing it down. I love hearing that…so many of us learn better through more than just reading. Being able to make the verses and reminders that jump out more tangible is awesome. 🙂 Blessings…thanks for being here! Do I struggle reading the Bible? I’m struggling right now. I should be making God first by reading His word, but I’ve been online checking out the NCAA brackets cuz it’s much more interesting. I find I enjoy reading other books not the Bible. I hate to admit it but it’s true. I have yet to find a way to make it more enjoyable, but lately I’ve been re-writing the portions of Scripture I read in my own words. I’m like Mel. I went to Bible school. I had to fill out faithfulness forms on devotional times that include reading Scripture. If something appears like work or an “I have to” than it is not enjoyable to me. I love creating with my hands! Crocheting scarfs is my latest obsession and I’d rather be doing that than reading my Bible. :-/ A doodle Bible sounds interesting. I’ve never even heard of it. Oh, I feel like I can relate to so much of what you shared here, Christine…thank you for being so honest. I think rewriting verses in your own words is such a great way to make the Bible even more personal. And I hope you have a chance to own a journaling Bible someday…it truly has made such a difference. 🙂 Blessings to you! Oh I love this Mel! I am a long time doodler of Scripture on church notes or in my journals and I have been seeing this Bible everywhere lately -but never in person! I am in need of a new Bible and I keep going back to this one but I have ordered it yet. What a fun (and important) giveaway! Hi, friend…love seeing your smile here today. 🙂 Thanks for your sweet encouragement…I hope you get a chance to own one soon! Love, love, love this post, Mel! God has definitely been speaking to me over the past few months about breathing new life into my time with Him. I have been inspired by several people in my different circles to learn to connect with God by using the unique wiring He created in me. Thank you for sharing! Hi, friend! 🙂 Yep, the doodling thing sort of grows on you…but some days I like to rewrite verses, too. That’s how I would work on memorization in college. 🙂 Love you, girl…thanks for being here! Do you sometimes find it challenging to carve out quiet time? YES!! The world can be completely filled with so much “NOISE” and it can become easy to get distracted but carving out quiet time needs to be made a priority! Oh, the noise…YES! Just this morning I sat down to read after I dropped off my daughter at PK, and there were still distractions and noise everywhere, it seemed. (I think I need to add earplugs to my quiet time, too.) 😉 Blessings! Mel, I loved this because it’s me! I have been in the same place. And I am also creative, always moving, always thinking, always creating and doing. Sitting still is very hard for me, so “quiet time” is a struggle. If I don’t win, I’m definitely buying one of these bibles! I was telling my husband last night that I wish I had more Bible to give away because it’s something that has truly changed my quiet time. I definitely think it’s worth the investment. 🙂 Blessings to you today…thanks for stopping by! Yep, you are speaking my language! Nice to meet you and your blog. I’ve been wanting one of these Bibles – great idea for a giveaway. I LOVE to write notes in my Bible. Love journal Bibles! I just doodled while praying and fasting for the first time on Saturday and it was amazing. I listened to praise and worship music, sang and made art while praying to God. It was awesome and just what I needed to bring new life to my prayer and fasting time! Thank you for sharing your heart! I think what I love about doodling is that there’s no right or wrong…and if I don’t like how a doodle looks, I can always turn it into something else. 🙂 A friend also shared something about using colored pens to code different things in her Bible reading…I’m curious. Blessings! This is wonderful and would be such a blessing to win! My oldest daughter is 13 1/2 this would be a great gift to give her to keep encouraging her to be in God’s word. She is very artistic and she loves writing. Thank you so much! I tHonk journaling is such a creative way to study Gods word!! Yep…and it’s so fun, too. 🙂 Blessings! I’ve always wanted to purchase a wide margin Bible and try my hand at scripture doodling. Thanks for offering the giveaway! Hi, friend! I love seeing you here. 🙂 Blessings and hugs! Would love to win the journaling Bible! Really enjoying GSD. It’s like your writers are in my head. Thank you for walking my dream with me. We’re so glad you’re here! 🙂 Blessings to you today, friend! Thanks for your transparency! I love that spending time with God and digging into His Word doesn’t have to look the same way every day for every person. I’ve been so intrigued by these journaling Bibles. Right up my alley!! Thanks for hosting such a great giveaway. I’ve wanted one of these forever. Right now my Bible is stuffed with notes and doodles and underlines and it’s not a journaling bible so it’s a bit hectic. I love the wide margins. Thanks for the chance to win one! I also find it hard sometimes – most days – to really get into the Bible! I do my Bible reading/devotions almost every day; but it turns out to be more of reading the devotion, which inclues a short scripture, and writing them into my journal with a short piece of what I “got out of it” (and usually ends up being more of quoting what is in the devotion…make sense?? That’s probably how I approach it, too!! Thank you for sharing and offering a giveaway of one of the Bibles! Good luck to all; and congrats to the lucky winner!! If it makes you feel better, I’ve done a random Zentangle or two in my Bible when I needed to really think through something. That’s the beauty of doodling and tangling…it’s all art! 🙂 Blessings to you. I do love to underline. love the doodling idea. thanks for the giveaway! I went to Bible college too, and yep, the Bible became a textbook. But for me, I loved reading it because I loved learning the historical parts, like how the people lived and why they did what they did. But then reading the Bible became more academic instead of letting God’s Word touch me personally and speak to my heart. That’s how I lost interest, and it took some creativity for me to get back into the Word and differentiate when I read it personally and when I studied it. I will never forget the day I realized that it wasn’t a sin to write in my Bible. Changed my way of looking at the Word. Instead of seeing it as something to put on a pedestal and admire, it became something to infuse into my life. I’ve wanted a journaling bible for a while now, winning one would be such a blessing! 🙂 Thanks for stopping by…blessings! What a wonderful giveaway! Would be such a blessing to win this! I would love to win this bible. I’m creative and even own a full-time handmade business, but I have been so intimidated by doodling and art journaling! I really want to stretch myself and try, especially when I think of the treasure a journaling Bible could someday be to my kids and grandkids. Thanks for the opportunity to win one! I love the thought of my daughter seeing my Bible as a treasure someday, too. 🙂 Thank you for being here, Melissa! Blessings. Hi, friend…love seeing your sweet smile here. 🙂 I hope you’ll be able to get (or win!) one soon. Love you! I really want one of these. I love that you are giving one away. My Bibles are so full of notes in tiny margins and need so much more space. I agree with what Mel’s said that God’s word is always the foundation of all of our God’s size-dream. Often I feel so hard to crave His word because of the busyness every day, but I found sitting, reading with soft music on the background, and doodling + drawing – are things can help me to connect to Him and His word. I like to use YouVersion app, read and listen the words at the same time 🙂 and then write down to remember. 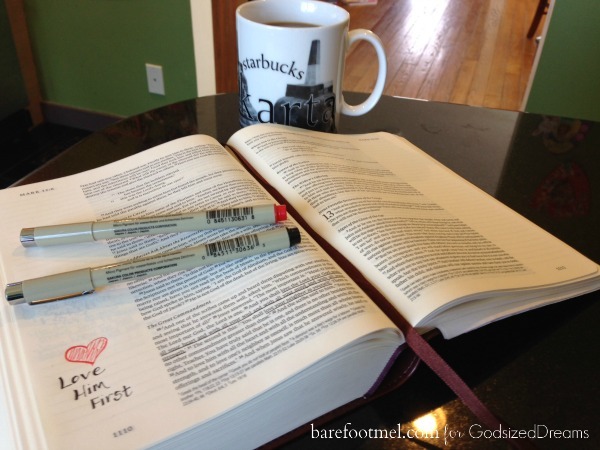 I didn’t even know a journaling bible exists – what a fabulous idea. Especially for this left brain girl who gets so focused on the how I often forget the Who – and yes, struggle to get to Him too. To be able to engage that right side, the creative side (and with permission, no less!) sounds fabulous. Thank you for sharing your heart so openly! I like to wake up early before my family wakes up to have quiet time. I enjoy my coffee and a bit of reading. I am intrigued by the journaling Bible but have yet to buy one. I have an art journal I use instead and I love the result of the doodling process.My daughter, however, found an old Bible and has begun the process if painting in it like that.